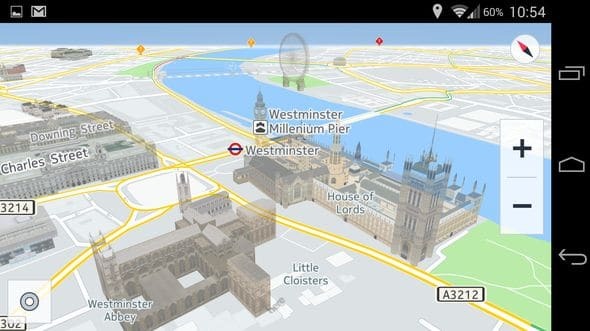 HERE Maps, produced by Nokia, is now available for Android devices. 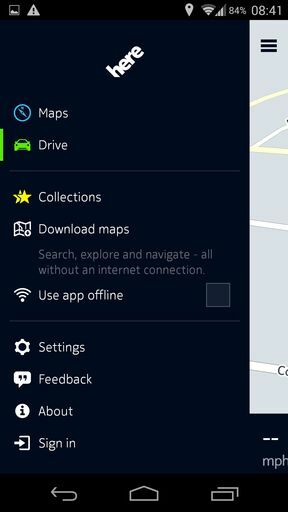 It is a major new app for the platform, bringing Nokia’s superior maps, as well a full offline satnav functionality. It’s also completely free. Originally available on Windows Phone devices, it was announced for Samsung phones earlier this year. A beta version is now available for a much larger array of Android phones, ahead of its expected launch on the Play Store. Presently, it needs to be sideloaded. 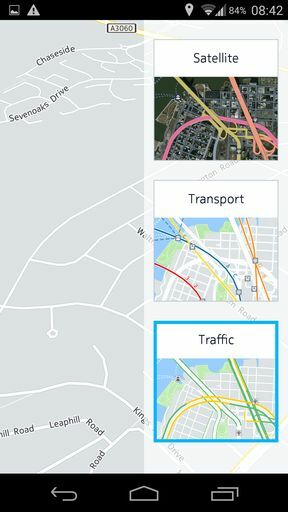 HERE Maps covers similar ground to Google Maps but it isn’t a Google Maps clone, nor is it a replacement for it. In some respects the two apps are complementary. Google Maps has a far greater broader aim, of being the location-aware hub of your smartphone. It enables you to easily search the area around you, finding shops, restaurants and business, reading reviews, checking in and so on. It all integrates seamlessly with the rest of your Google account, and works especially well with Google Now. HERE Maps is focussed much more on navigation. Natural language searches do work—a search for ‘Chinese restaurants’, for instance—and there is a points of interest directory that will display nearby businesses and locations within a set distance. But the app is much more concerned with getting you to these places, rather than merely showing what’s around you. And it is here that it truly surpasses Google’s offering. Google Maps has always been functional as a satnav tool, but never outstanding. It’s major weakness is mediocre support for offline use. You can download map regions within Google Maps, but not entire countries. And search and navigation within these regions is not possible without an internet connection. For day to day use this is not a major issue, since most users will have a decent data plan a good network coverage. But it does make the app far less useful overseas, where your data use is likely to be much more restricted. As such, the two apps can work well alongside each other. The Google-ness of Google Maps is a plus if you’ve bought into the Google ecosystem (which, as an Android user, you probably will have), and HERE Maps over when what you need is a full-on satnav system. The HERE Maps UI is straightforward and familiar. The screen is fixed firmly in portrait orientation until you switch into navigation mode, whereupon you get something more suited to in-car use. The maps are clean and easy to follow, with options to view satellite maps (which are not as high res as those from Google), or overlay live traffic information or details of transport links. A small arrow on screen shows your position, along with the direction you are facing. For many walkers this is enough information to find your bearings, but the navigation features are far more complex if needed. Other standard features are supported, like favourite places, known here as Collections. You need to create an account to save these, as well as to download maps. Facebook sign-in is an option. 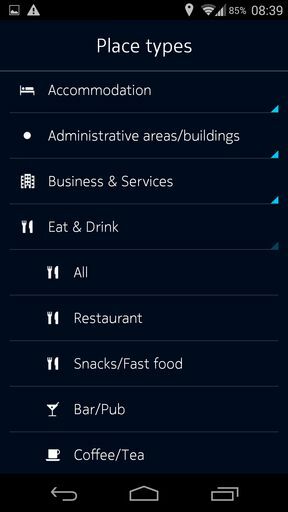 Tapping in the Search box at the top of the screen enables you to search for locations, as well as access different categories of place. Alternatively you can hit the navigation icon to instantly choose a destination and plot a route from your current position. You can select routes for driving, public transport, and walking. Swiping from the left opens the sidebar with further options. From here you can switch into Drive mode, a landscape-oriented view with big buttons and only key information for in-car use. Below this is where you access HERE’s major selling point: offline mode. After logging in you can download entire countries or even entire continents, all for free. The maps are fairly large, so you’ll need to be selective about which ones you need, but not so large as to restrict your use. The whole of Europe, for instance, is around 9GB, but the UK alone is 663MB. The USA is over 4.5GB, but you can choose individual states to download, as you can with India, which is about 1.2GB in total. Once you have download your chosen maps you simply need to tap the Use app offline option in the sidebar and you’re done. So long as you’ve downloaded the map for the location you’re in, you won’t notice any difference between online and offline use. It’s pretty great. 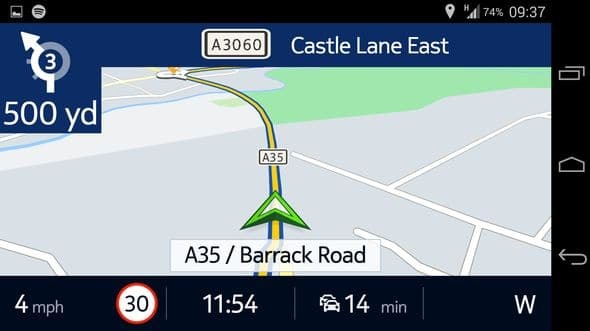 HERE Maps offers virtually all of the features you’d expect in a dedicated satnav app. This includes Hi-Fi voices. About 10 times larger (typically 50MB compared to 5MB) than the normal voices, they are clearer and less synthetic than the standard satnav voice and well worth using if you’ve got the storage. There’s also 3D buildings, configurable points of interest, live traffic information, alternative routes and customisable views. It is a very comprehensive tool. As a beta app we did encounter a very occasional graphical glitch when switching between portrait and landscape. Otherwise we found it to be very stable and ready for daily use. HERE Maps has very quickly established itself as one of the must-have apps for Android. While not a direct replacement for Google Maps, it is better in the areas where it excels, namely navigation and offline use. It’s remarkable to think that it is free. 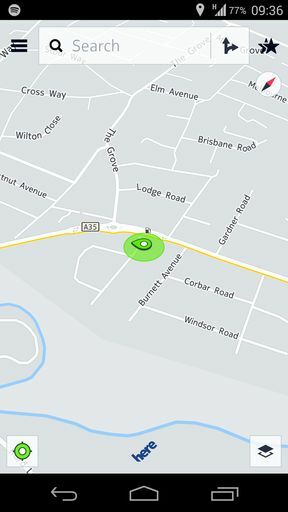 Most free satnav apps on Android use the OpenStreetMap service, whose coverage and map quality can vary between excellent and patchy depending on which location you’re in. HERE offers the kind of quality you’d expect to pay for, and its rival apps like CoPilot and TomTom are among the more expensive on the store. HERE Maps is easily the match of those, and we’d go so far as to declare it as the best satnav you can get for Android today. The best satnav app for Android. A full, offline service with free global maps—this is an offer that simply cannot be beaten elsewhere.